The past week was the annual Blankenheim Newport Vacation. We co-own a boat with my brother- and sister-in-law, and have started a tradition of spending a week or so in Newport Beach each summer (my husband and his brother went to college down there and lived on Newport Beach). I headed into the trip with a heck of a head cold… because that’s how I roll. The very first day, the guys went out fishing, but the girls/kids stayed on shore. I did a bit of napping and then hit the beach. My niece Katie is a serious beach girl… the two of us probably spent more time in the water than we did on land! The hotel we stay at is fantastic – one of the perks is they loan you boogie boards and beach stuff, so you have tons of options. We have become expert boogie boarders… I have the sunburn to prove it! Then main goal the boys had this trip was to catch a shark. I must say, they were (mostly) well prepared. They found the spots the sharks were at (saw them with my own eyes), they had the right bait (caught my share of mackerel), and they had the right equipment… sort of. They were definitely catching them (mostly thresher sharks, which scare the crap out of me), but ran out of the metal leaders. This is a very important thing because threshers use their gigantic tails to slap at their prey – the fishing line in this case. On our last full day there, we got up early (well, at the same time we did every other day – 4:30am so that we could get on the water) and headed over to Catalina Island. It was a beautiful boat ride over… we saw all sorts of cool marine life – flying fish, dolphins, seals, sharks (mako sharks, we think), and mola (very cool, prehistoric looking creatures). My favorite part of the journey over was the dolphins. 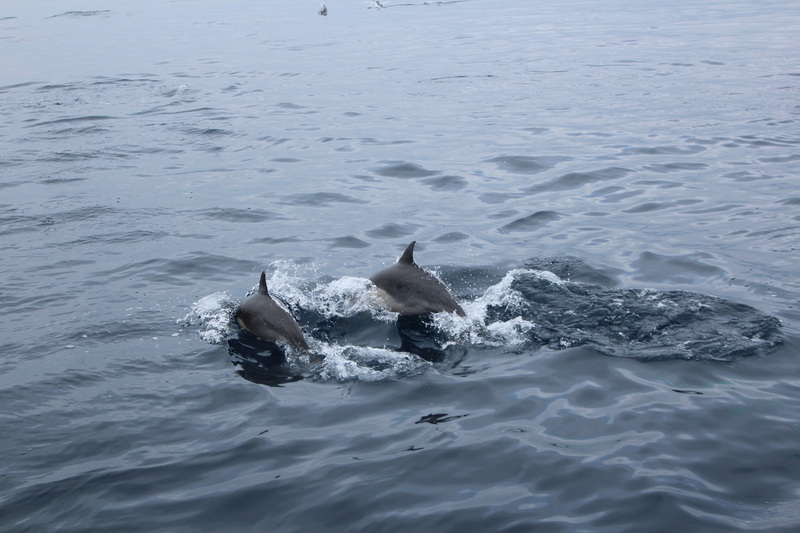 I am not exaggerating when I say there were probably hundreds of dolphins swimming around our boat. We found a pod that was feeding, so there was much breaching of the water. They chased our boat, played in our wake, and lead the way. It was absolutely breath-taking to see. I took pictures, but they don’t come close to capturing how amazing it was to be there. Once we got to the island, we got serious about fishing. 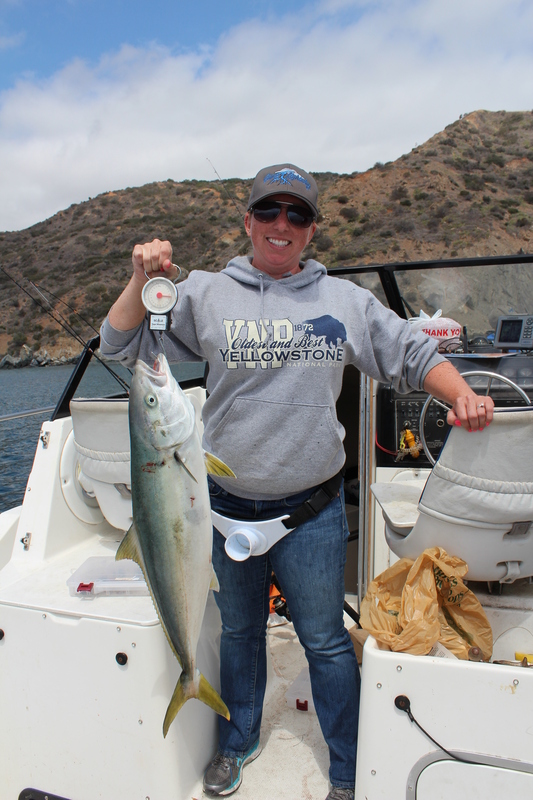 I caught the biggest fish I’d ever caught in my life… a roughly 15 pound yellowtail. 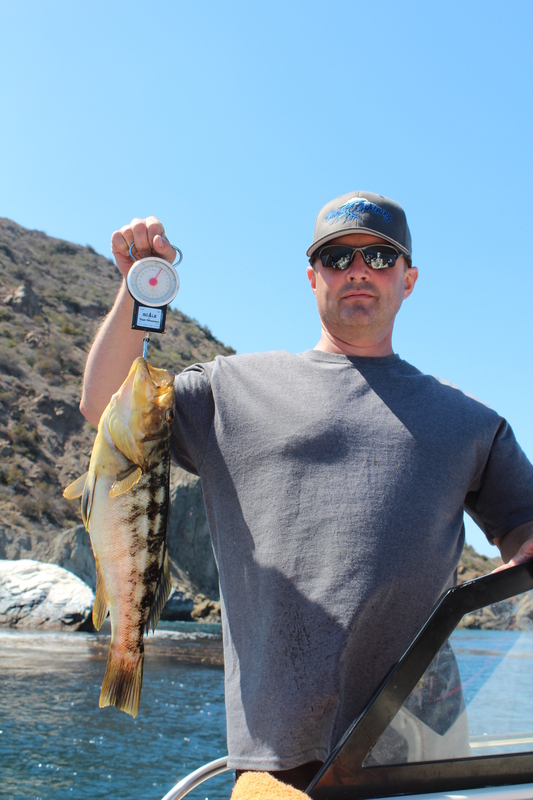 I have not done a ton of ocean fishing, and when I have, I haven’t caught anything really big. This one was amazing… I was letting my line out when I suddenly felt the reel start to go faster. I clicked over and the pole practically bent in half. It took 5-10 minutes for me to reel it in, with Mike and Charlie coaching me/moving things around on the boat as I went. It was hilarious to watch the two of them try to buckle the pole holder on me while I kept reeling. I even baited my own hook! I’m sad to see this week’s vacation come to an end… it was so nice to spend time with my hubby and family! Tomorrow it’s back to the grind… gotta work hard to play hard! Stay tuned for posts on the rest of the week – including the Western States Horse Expo!